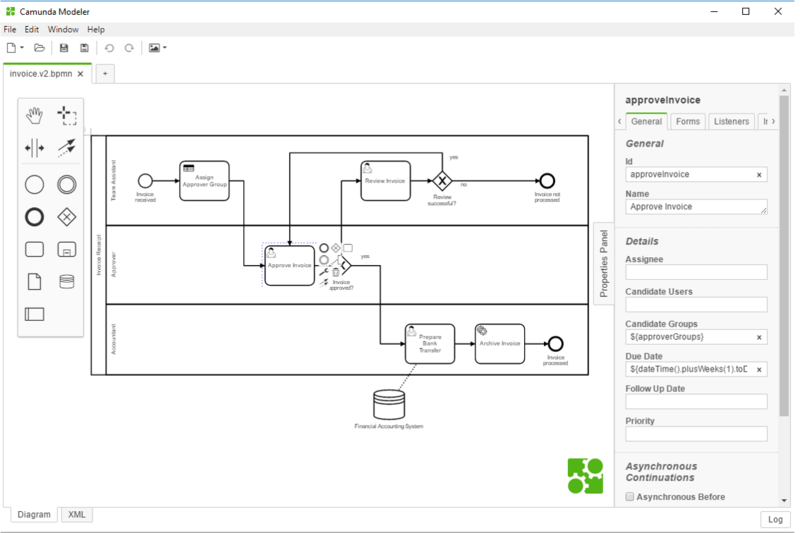 Camunda Modeler is a desktop application for modeling BPMN, DMN and CMMN. It allows you to model files located directly on your local file system. This is a guide to get you started with modeling BPMN and CMMN diagrams and DMN decision tables. Make sure to Install the Camunda Modeler first. For executing BPMN Diagrams created using Camunda Modeler, Process Engine version 7.4.0, 7.3.3, 7.2.6 and above is required. How to model executable BPMN 2.0 process diagrams. How to model executable CMMN 1.1 diagrams. How to model executable DMN 1.1 decision diagrams (DRD) and tables. Extend the modeler with custom elements. A collection of tips and tricks that make using the modeler most convenient.